Rabbi Shimon Miara has been an expert mohel for nearly twenty years. 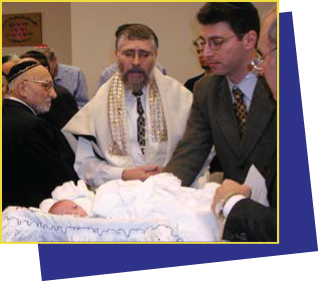 He has conducted Brit Milah (Jewish ritual circumcision) in the greater Boston area, and throughout Rhode Island, New Hampshire, Vermont, Connecticut, Maine, New York, New Jersey, Ohio, Maryland, Washington D.C., Virginia, Colorado, and California. Although mainly performing Brit on infants, Rabbi Miara has also performed many surgical circumcisions (with urologists) on adults and toddlers in hospitals such as Boston's Children's Hospital, Beth Israel Hospital, and Massacheusetts General Hospital. A father of seven, needless to say, Rabbi Miara was the mohel for his own sons. Rabbi Miara received his education in Israel, where he studied Jewish studies at Yeshiva Kerem B'Yavneh and received his smicha (rabbinical ordination) at Yeshiva Ateret Tzvi. He obtained his Bachelor's Degree at Bar Ilan University, where he majored in psychology and education. His first position was in the United States as youth director at congregation Knesset Israel in Minneapolis. The Miaras were married in Jerusalem, and immediately left for rabbinate and teaching positions in the United States. After receiving a bracha (blessings) from Rav Ovadia Yosef, formerly Chief Rabbi of Israel, the Miaras moved to Phoenix, Arizona, where Rabbi Miara served as assistant rabbi. In 1982 he became assistant rabbi in Savannah, Georgia. In 1984 he accepted a similar position in Lowell, MA. Mrs. Miara taught kindergarten and Jewish studies in these communities. In 1989 they came to Brookline, where Rabbi Miara taught at the Maimonides school. Now he is well known throughout Boston as a mohel and sofer (Jewish religious scribe). Wherever they have lived, the Miaras have sought every opportunity to share their love of Judaism and to assist their Jewish community. In Phoenix and Savannah, Rabbi Miara opened a medical equipment gemach (free loan organization) to collect equipment for the aid of the Israeli community in B’nai B’rak. In Lowell he taught Daf Yomi classes (an organized, international program of daily Talmud study for Jews of all backgrounds), and helped found the NCSY (National Council of Synagogue Youth) chapter. While in Lowell, Mrs. Miara began her career as an artist skilled in decoupage. Now she is beginning a new career as a holistic practitioner. The Miaras dedicate their concern, their energy, and their excitement to every community in which they live. In Savannah, they taught the community to celebrate the Jewish holiday of Lag B’Omer. In Lowell, the Miaras attended every NCSY Shabbaton, bringing their three children. The Brookline community knows and loves the whole family for their kindness. Rabbi Miara and family weekly visit the sick at Coolidge House (a local home for the aged), where he leads Shabbat services. His visits with his family to the sick and aged are the highlight of the day for many patients; strengthening residents' connection with youth, life, and the love of Jewish tradition. Rabbi Miara has also served for the last two years as a chaplain at the Massachusetts General Hospital.